By the time the Headhouse Farmers' Market closes for the season Dec. 18 Ben Wenk plans on selling hard cider made on his family's Three Springs Fruit Farm in Adams County. He's been thinking about making hard cider ever since he and his father, Dave, first sold their produce at Headhouse when the Food Trust's big market opened in 2007. "After our first day at Headhouse my dad and I decided to have a celebratory drink at what is now Cavanaughs," explained Wenk. "I got whatever tap handle I didn’t recognize and I ordered Strongbow, thinking it was a beer and not realizing it was a cider." Ben had tried hard ciders before, like Woodchuck, but found them too sweet for his taste. But he and his dad both enjoyed the drier example. "Dad turns to me and said, like, we can make this sometime. So later that year bought used bourbon barrels and started experimenting." Since then Wenk has taken cider much more seriously, and three years ago began planning his own commercial cidery, with help and support from some of his neighbors, including Big Hill Cidery up the road. For pressing his apples into juice, Wenk brings his bins over to Lem Christophel who runs Eden Garden Farm in nearby Dillsburg (and sells his crop at the Clark Park Farmers Market, also, like Headhouse, operated by the Food Trust). Cider can be made from "dessert" apples, those meant for fresh eating, and it will be good. But Ben's long-term plan is to take advantage of classic cider varieties, most of which are too bitter or astringent to be appealing in a lunchbox. So in 2013, after considerable research, Ben ordered a variety of cider apple trees to plant. They arrived and were planted last year, and may produce a few useable apples next season, but Ben isn't figuring on a significant yield until three or four years from now. A good cider, like a good wine, takes time. Wenk explained there are four basic classifications used by the British (his inspiration in cider-making): sweets, sharps, bittersweets and bittersharps. Among the varities he's planted, some British in heritage, others American, are Dabinett, Stoke Red, Somerset Redstreak, Chisel Jersey, Harry Masters Jersey, Frequin Rouge (a traditional French variety), Brown’s Apples, Granny Winkle (an American apple, advertised as early as 1803 by a Burlington, New Jersey, nursery), Roxbury Russet and Wickson's crab. Among the more common sweet varieties Wenk plans on using are Golden Russet and Albemarle Pippin (also known as Newtown pippin). This season's hard cider will get much of its oomph from two dessert apples, one which has been a standard for the past few years, Gold Rush, and another which Wenk planted a few years ago and is just now bearing fruit in sufficient numbers, the Esopus Spitzenburg. The former is an extraordinary juicy sweet apple developed in the 1990s in a joint program by the Indiana, Illinois and New Jersey experimental agricultural stations, the latter, one of the oldest North American apples, another good juice producer with a complex flavor. "Both Gold Rush and Spitzenburg are high in acid and brix [a measure of sugar in liquids), so they're good apples to blend," said Wenk. The sugar content is important, not so much as to add sweetness to the final product but to provide food for the yeasts that turn apple juice into hard cider. By itself acidity doesn't make a good cider; but acids with a tannic quality do. Tannins add dryness, astringency and texture to the final product, and that's a quality many traditional cider varieties have in abundance. While his cider trees grow toward production levels, Wenk is experimenting by adding other fruits and botanicals with tannins to his mix: dry hops, chokeberries, "and similar substances to get that really bitter characteristic into our blends." Although Wenk regards cider both in its production methods and taste qualities as closer to wine than beer, he buys into the experimentation American craft brewers are noted for and applies it to his cider. "We take English cider makers as our inspiration," he said. Indeed, English farm tradition provides the name for his cider: "Ploughman", as in "Ploughman's Lunch," the traditional midday meal of pickle, bread and cheese. "Like most American craft producers we use traditional methods but like the opportunity to experiment". Not orange creamsicle, he's quick to add, but he will "take the best of what’s on the farm and put it it in the bottle. If blackberries are good one year, we’ll add those. We're taking a winemaker's approach in creating a cider that a craft beer drinker would like." He hopes to add "terroir appeal" by experimenting with natural yeasts, "an expression of the soil the apples grown in," although right now commercial yeasts provide the consistency he needs. Wenk plans to sell the cider at the farmer's markets he frequents, including Headhouse here in Philadelphia, other markets in Pennsylvania close to his Adams County base, and to taverns in Washington, D.C. He also plans to sell to kegs to Philadelphia restaurants where he currently supplies fruit. Wenk sees cider as one more attraction to lure visitors to Adams County, beyond the battlefield at Gettysburg. "I think hard cider in the U.S., especially east coast, has really grown up. We want to make Adams county a destination to visit and drink cider in," said Wenk. The name of the stall is Franks A Lot, but they don't have a lot of franks. And the franks they do have are cooked in about the worst way possible, heated rollers, like you'd find in a convenience store. I'm a hot dog snob so I've given up getting a tube steak here. But there's plenty else to choose from, and all of it is a better choice. Hot dogs make up only one-eighth of the space on the stall's menu boards, the rest of it filled with various barbecued and fried chicken offerings, burgers from beef or turkey, kielbasa and Italian sausage, meatballs, pierogies, and various sides, including cornbread and mac 'n cheese. After a brief experiment the stall gave up on salmon burgers. I haven't sampled the complete menu, but the potato pierogies are the real deal. Maybe not quite as good as what you'd find in certain Port Richmond establishments, but close enough. Likewise the barbecued chicken will satisfy; not quite the same style as you'd find at Dienner's in the Pennsylvania Dutch section of the market, but equal in quality. 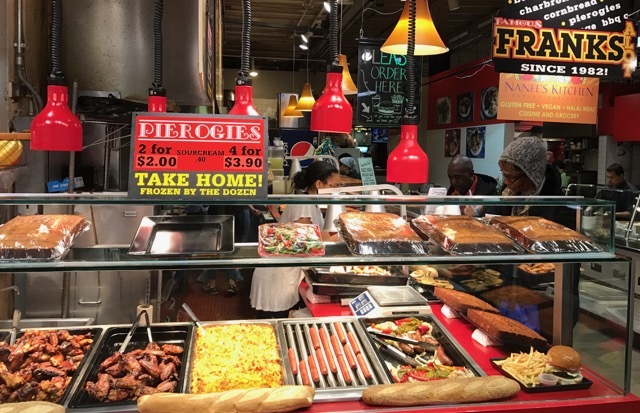 A lot of the small stuff – but very important stuff – has been changing at the Reading Terminal Market. Things like adding a bolstered schedule of events at the market's kitchen, recipe cards using ingredients from market merchants, a wider social media presence, and more frequent evening programs and events. And then there's the stuff that never changes – the myriad details to keep the market operating smoothly, working with the market's board in selecting new vendors when the rare vacancy occurs, and managing the market's landlord-tenant relationships with its 80 vendors. All this and more are on the plate of Anuj Gupta, who took over as general manager of the market 16 months ago. As Gupta sees it, his job is to build on the solid foundations left behind by his predecessor, Paul Steinke, who now runs the Preservation Alliance for Greater Philadelphia. 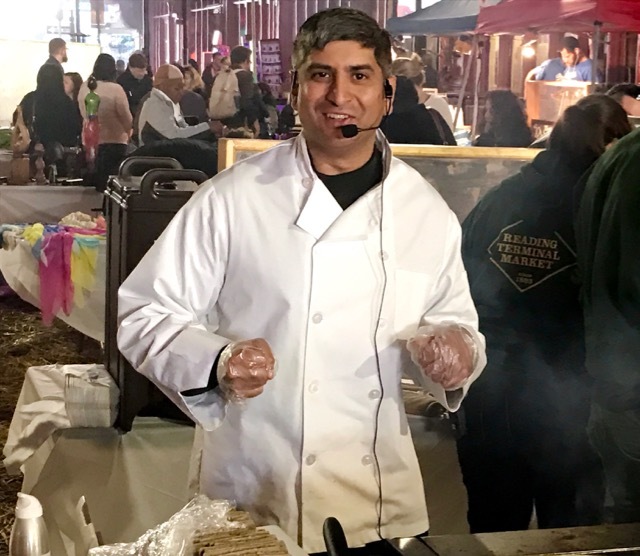 Gupta's overriding goal is to "recenter the market into Philadelphia’s culinary world and put it on top again." That's a challenge, especially with the opening of the new, enlarged Whole Foods off the Parkway which, through its design, tries to mimic the Reading Terminal Market with shop-like areas for meat, fish and cheese, a food hall-like eating area, and stalls operated by local restauranteurs. 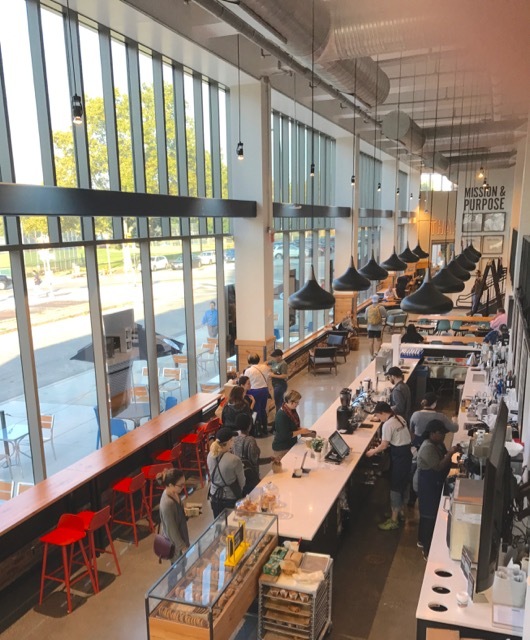 Other competitors nipping at the market's heels include MOMs Organic Market, which is slated for the new East Market Street development at 11th street, just around the corner, and the ever-expanding Snap Kitchen prepared food chain. To compete Gupta believes the market must make the customer experience as good as it can be. One step in that direction is a service half-heartedly tried with little success about a dozen years ago at Iovine's Produce Market: bag storage. Gupta is bringing it back, under the "Shopper's Concierge" moniker, but thinks with additional promotion and services it can succeed where it's predecessor failed. "I've shopped here for many years as a regular Saturday morning customer, and I stopped when I couldn't carry anymore," he said. "I would have bought more if it was easier to get around." The weekend-only (for now) concierge service, located behind the Head Nut near the Shoe Doctor and rest rooms, will store your purchases as you shop, including those that must be refrigerated, and, on Saturdays, bring them out to your car when you're done. Gupta acknowledges there's no guarantee the new service won't fail like the earlier one, but "we’re going to keep doing it. I’ve realized how long it can take for things to adapt here, to merchant or customer behavior. Maybe in the long run it doesn’t work, and if it doesn’t we’ll get rid of it. But it’s impossible to try something for even three months and come to any conclusion." Communicating the market's offerings is an important part of the effort, and the market has upped its game in the social media arena. Christen Rhoadarmer, a graphic designer Gupta added to the market's small management staff is also charged with generating social media contents and works with Gupta to produce the market's live video feeds, usually interviews with vendors, on Facebook. Key among the benefits Gupta inherited from his predecessor is the market's solid financial footing. Before taking on his new post Gupta led the Mount Airy USA community development corporation where, like many non-profits, "I could not fundamentally change the dynamic of every two weeks trying to make payroll, which bills I could pay, which bills I couldn't." Although proud he left the organization in better financial shape than when he arrived there, he's thankful for the strong financial condition of the Reading Terminal Market. "While we raise money here, we do it for special capital projects, it’s not for our survival," he said. "And that’s huge relief. I’m able to spend my time on my job, that’s a tremendous benefit to any non-profit organization." One capital project recently completed is "invisible to customers but has great impact top market’s operation." That's a closed-water loop which functions as a heat removal system for the basement, a non-ventilated, non-air conditioned space where temperatures could become unbearable with the heat thrown off by all the refrigeration units supporting the main floor vendors. Work to capture that heat started under Steinke and followed through under Gupta's leadership. With the completion of the project this past July, "everyone who has refrigeration equipment has to link into it, taking the hot air previously dumped onto the floor into the water discharge. It’s already had an impact." With the excess heat now helping to heat the market's hot water system, it "opens up a lot of additional possibilities of using space downstairs, and there’s still a vast amount of space that we don’t use because it’s been so unbearable." On the customer front, the market is working with the hospitality school at Temple University to develop an "ambassador" program. When implemented, Temple students will wander the floor of the market helping visitors find merchants and directing them to services. Gupta is also working with Drexel University to develop a better way to convey the market's past. "The market's history is rich in so many ways: architectural, operational, the legacy of family owned businesses, the diversity of our customer base," he said. "You don’t get any sense of that in a formal way when you come here." Still, Gupta laments that "most people don’t even know it was an operating train shed. When out-of-towners come and I give them a tour I tell them when you bought the Reading Railroad in playing Monopoly, you also bought this building. They’re quite surprised." 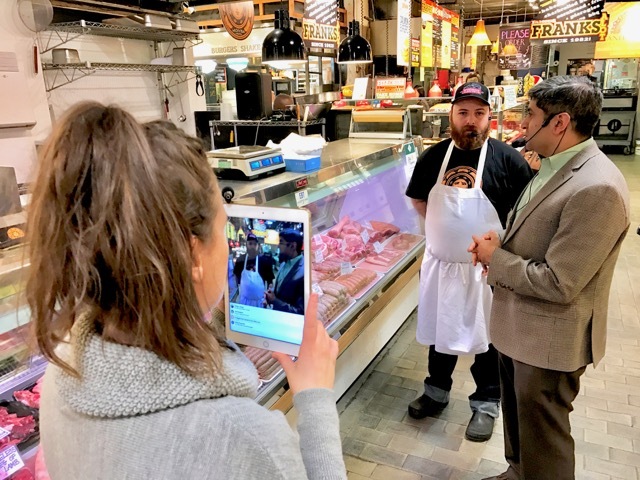 Earlier this autumn the Reading Terminal Market inaugurated a series of "Ask the Experts" videos on its Facebook page, featuring market merchants discussing the specialized items they sell. RTM General Manager Anuj Gupta conducts most of the interviews, but retired Philadelphia Inquirer columnist Rick Nichols also leads some. The videos are fed live on Facebook, but you can find an archive of the "Ask the Expert" series – as well as videos from the market's City Kitchen cooking demonstration series – on the RTM's FB page. Here's a quick compendium of links to the "Ask the Experts" videos posted so far. Amy's Place, kitchen supply store. La Divisa Meats, fresh red meats and charcuterie. Mueller's Chocolates, chocolates and other candies. Pennsylvania General Store, Keystone state-made foods and kitchen crafts. Hatville Deli, Pennsylvania Dutch style deli meats. Kauffman's Lancaster County Produce, fruits, vegetables, dry foods, Amish crafts. Cookbook Stall, cookbooks and food magazines. Giunta's Prime Shop, meats, poultry, deli meats. Condiment, prepared sauces, marinades, doughs. Ben Wenk and I spend nearly five minutes at this morning's Headhouse Square Farmers Market discussing apples and cider, and one variety in particular that he is selling for the first time this year, the Espopus Spitzenberg. Ben, who brings his family's Three Springs Fruit Farm output in the Adams County, Pennsylvania, fruit belt, to markets here, in Maryland and the District of Columbus, was quick to note the apple was Thomas Jefferson's favorite. It's one of mine, too, and not only because of its flavor and storage qualities. As I noted in a post five years ago, when I purchased the variety from North Star Orchards, the apple is named after the Esopus Creek in Ulster County, New York. I took many a dip in this icy-cold, rocky waterway in the northern Catskills during family vacations in the 1950s. The Espopus is a favored trout stream and also feeds into the New York City water supply through the nearby Ashokan Reservoir. 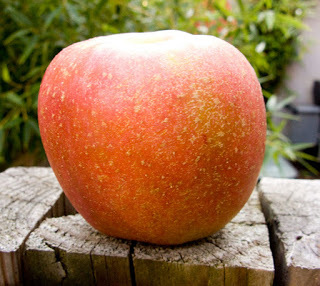 The apple offers great balance between sweet and tart, with a honey-colored, crisp and spicy flesh and a orange-dappled skin. The Espopus Spitzenberg's complex flavor is matched by its pleasant aromatic qualities, making it an excellent "dessert" apple, one that's meant to be eaten as is (though it's a good cooking apple, too). It's not an easy apple to grow, however, and prone to just about any disease that strikes other apples. Like many late season apples, it 's a "keeper" which, like a fine wine, improves with age; the apple you put in the crisper today will be even deeper in favor come late January and February. Ben had a full bin of another "keeper" today at Headhouse: the Arkansas Black. perhaps the hardest, crispest apple I've ever tasted. It might lose a bit of that crispness after a few months of storage, but it will still be suitably crunchy. As it stores it will even become darker in color, as well as develop a waxy finish. Unlike the Esopus, however, it's a rather one-dimensional apple in flavor: all sweetness, with little apparent tartness. Still, it's a tasty apple with admirable qualities. Although it's parentage is a mystery, the Arkansas Black is probably descended from the Winesap. If Ben still has them next week I'll buy a big bag of Esopus Spitzenbergs for my crisper. But the "keeper" I'm waiting for is the Newtown Pippin, another variety that improves immeasurably after a few months in storage. North Star Orchards usually has them in November. As a rule, the later in the season an apple matures, the better it is as a storage apple. The Newtown Pippin will soften just a tad in storage and it's skin may wrinkle a bit, but it's fine eating. 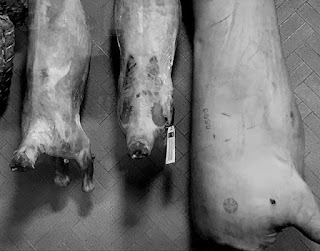 In the more than 10 years since this blog started I've posted at least a dozen items about lamb. Here's another, this time focusing on one of the few remaining bargain cuts: shoulder. 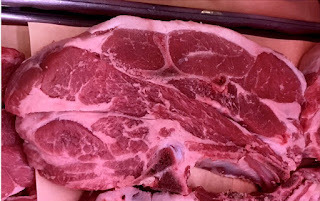 Most of the time I go for shoulder chops, which could be purchased this past weekend at the Reading Terminal Market for $5.49 to $8.99 a pound, about half the price you'd pay for loin or rib (rack) chops. As much as I enjoy a thick loin chop or lamb "lollipops" cut from the rib, the heartiest lamb flavor can be found in the shoulder chops. 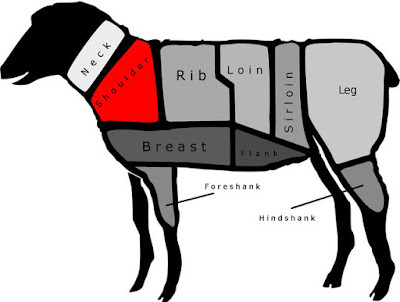 The cut is less tender, which is one of the reasons why shoulder is less expensive than loin or rib. Just as in beef steaks, the more tender cuts command a higher price. But what the shoulder lacks in relative tenderness, it more than makes up in flavor. And even though shoulder isn't as tender as the other lamb cuts, it can still be rewarding when simply grilled; it may be a bit chewier than the other cuts, but it's not too tough for the high, dry heat. 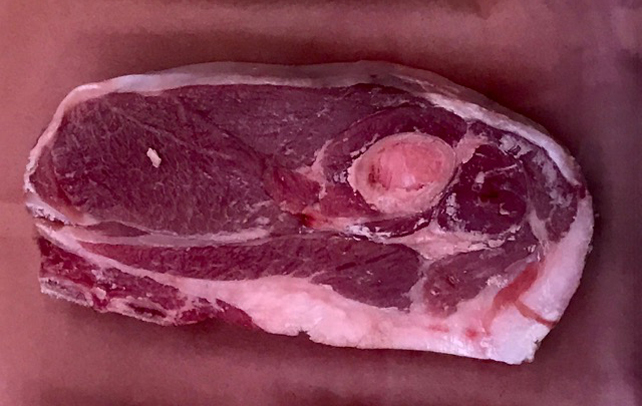 Shoulder chops come in two different cuts: arm and blade. Arm chops, as you might expect, are cut from the part of the shoulder closest to the arm, hence the round bone you'll find in this style. The blade cut comes from closer to the neck and features -- guess what -- the shoulder blade bone. In recipes they are fairly interchangeable. Although some think the arm chop is more suitable to braising than the blade, both can be broiled, grilled or pan-fried. The arm chop will have less fat overall as well as less marbling. The blade looks like a smaller version of the beef chuck blade steak and has more marbling. No matter the cooking method, shoulder needs to be cooked to at least medium, and also holds up to longer cooking -- though if you go beyond medium well you do risk shoe leather. If you're braising them you can go with a thick cut, but when grilling, thinner is better; I like them cut no more than three-quarters of an inch. 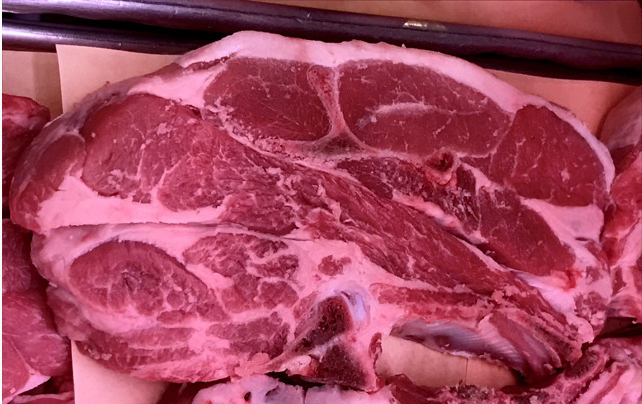 When I stopped by Nick Macri's La Divisa Meats he only had large pieces of shoulder, not chops, but he was more than happy to cut to order. Before grilling I bathed them in a yogurt marinade. Although the marinade has some ability to tenderize, it won't turn the chop into a tenderloin. Instead, I use the marinade for flavor. For the two chops (which weighed in at a total of 14 ounces, just under a pound) I mixed about four ounces of full-fat plain yogurt (not Greek) with a couple tablespoons of olive oil, four cloves of minced and mashed garlic (adding a little kosher salt while scraping the cutting board with the back of your chefs knife turns minced garlic into a mash), the zest and juice of a small lemon, and whatever spices or herbs strike my fancy. This time it was cumin and cardamom -- two tablespoons each, ground. I placed the chops in a single layer in a non-reactive baking pan, salted and peppered them, then spread the marinade on both sides of the chops. I covered and refrigerated them for six hours, though you could certainly leave them overnight or cut the time down to four hours. I didn't bother wiping off the marinade when it was time to hit the grill, I just placed them on the hot oiled grate over a medium fire and cooked about four-to-five minutes a side for medium. I cooked up a mess of mustard greens with garlic as my side dish. A cold lager or your favorite red completes the meal. The crowds were thick this weekend at the new Whole Foods just north of the Parkway. Which is why I waited until 7 a.m. Monday to visit. I wound up spending the better part of 90 minutes sipping coffee and wandering its aisles, asking questions of the cheesemongers, fishmongers and meatmongers at this pantheon to conspicuous consumption of comestibles. First, though, I need a caffein jolt, so after arriving I ordered a coffee and "Krough-Amann" from the coffee bar's small collection of pastry and bagels. This offspring of the cronut came in two varieties: one with ham, swiss cheese and topped with confectioners sugar and, the one I selected, filled with a little bit of feta cheese and a single stripe from a sun-dried tomato. Too greasy. I'd rather have a grilled cheese sandwich with bacon. The coffee bar turns into a real bar at 11 a.m., with wine, beer and cocktails. The coffee itself is a Starbucks clone. Since I'm not a Starbucks fan I wasn't impressed, but that's a matter of taste; you might like it. The store's designers are no doubt betting that a goodly number of the many Fairmount residents who walk by each morning on their way to Center City offices will stop by for coffee and more. Its entrances are aligned with the street to draw them in. Pre-made meal kits in one of the refrigerator cases, right next to pre-made whipped cream in clamshell containers. No aerosol Reddi-Wip here. The cheese selection is good but missing items it should have, like a really sharp cheddar, what I fondly call "rat cheese", the type of cheddar that crystallizes, crumbles and tastes intensely salty with a hint of sweetness. When I asked the cheesemonger how long the cheddars had been aged, he didn't know. He thoughtfully tried to find out, but their reference data sheets hadn't been organized yet. Meats have always been a Whole Foods strong point. At the old store there was a small case where you could see some beef aging; here they've got a big walk-in box filled with a couple of sides of sheep, pig and veal, as well as primal cuts of beef aging. At least one on-line commentator I read complained about having to view meat on the hook. Really? Where do you think your hamburger comes from? Although Whole Foods hasn't shaken it's reputation as Whole Paycheck (most items are pricier than you'd pay elsewhere for similar quality) you can find the occasional bargain. One example: I regularly buy U.S. wild-caught frozen shrimp, shell on but cut and deveined at Wegmans in Cherry Hill for about $30 a two-pound bag. Here they were $20 for the same weight, although the shell wasn't cut along the back nor were the veins removed. Still, a very good price for a high-quality product. The fresh seafood section at the new Whole Foods keeps up their quality standard and the prices, while a bit high, are within range, more expensive but better quality than the Reading Terminal Market, but less broad a selection. They will, however, cook whatever you like in-store, something I first encountered in midwestern supermarkets like Schucks in St. Louis. I liked the idea of the self-serve fresh pasta case and will get around to trying them some day soon. The produce at WF has never impressed me, the quality better and the prices cheaper at the Reading Terminal. In one news report on the new store, the writer noted that if they don't have a produce item, they'll order it for you, citing dragonfruit and prickly pears as examples; no need to order these at Iovine Brothers at the terminal, which stocks them regularly. Next time I'll have to come for lunch to try out the four stalls from Dizengoff (hummus), CHeU Noodle Bar, Severino Cucina Rustica, and the vegan Wiz Kid from Rich Landau and Kate Jacoby. The pita at Dizengoff is mixed and baked on site. "No, we don't have quiches. We do have knishes." As I waited for my belly lox this morning at the counter of Schlesinger's Deli, Locust Street, Philadelphia, that's what the server told a potential customer on the phone: "No, we don't have quiches. We do have knishes." For 20 years, veal scaloppine sandwiches were on the menu at DiNic's in the Reading Terminal Market. But when the increasing wholesale cost of veal reached a level that required a too-pricey price on the sandwich, owner Tom Nicolosi switched out pork for veal. In an application like scaloppine, the taste difference between pork and veal is minimal, especially when served with plenty of peppers and onions. But the very fact that the menu board read "pork" instead of "veal" caused sales to plummet. Eventually, the stall removed scaloppine in any form from the menu. But this week for one day only, Thursday, DiNic's will bring back veal scaloppine with real veal, though cut from the shoulder not the leg to keep the price point within bounds, according to Joe Nicolosi, who took over the stall a few years back from his now mostly-retired dad. At the same time, Joe has dropped his experiment of preparing cracklings as an occasional adornment to his sandwiches. Simply a case of not worth the extra effort from the business point of view, though the handful of customers who looked forwarded to the cracklings are no doubt disappointed. 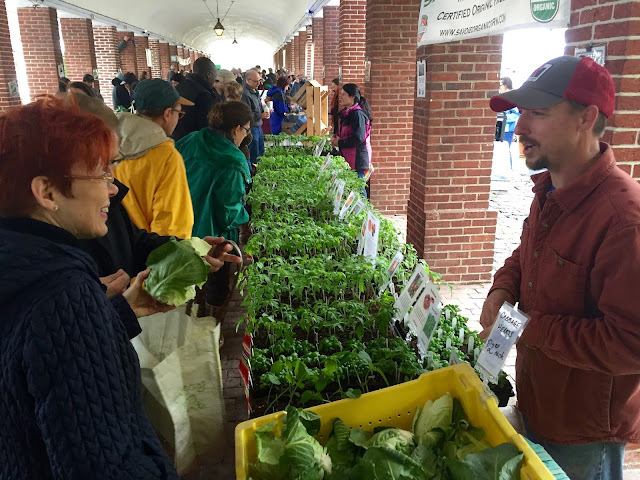 The Food Trust's Yael Lehmann snipped the ribbon to open the 10th season of the organization's farmers' market under the shambles at Headhouse Square. A healthy contingent of 24 vendors -- including six that were actually selling fresh produce you could actually bring home and eat -- showed up under the constant rain. Additional vendors are expected next week. Crowds were sparse (at least during the market's first half-hour when I visited) but eager to take advantage of the offerings. Asparagus, one of the quintessential vegetables of spring, could be found at two stalls, A.T. Buzby and Three Springs. Buzby also offered hoop house tomatos, while Ben Wenk of Three Springs mostly featured storage apples and prepared items, including ketchup as well as canned fruit, jams and preserves. 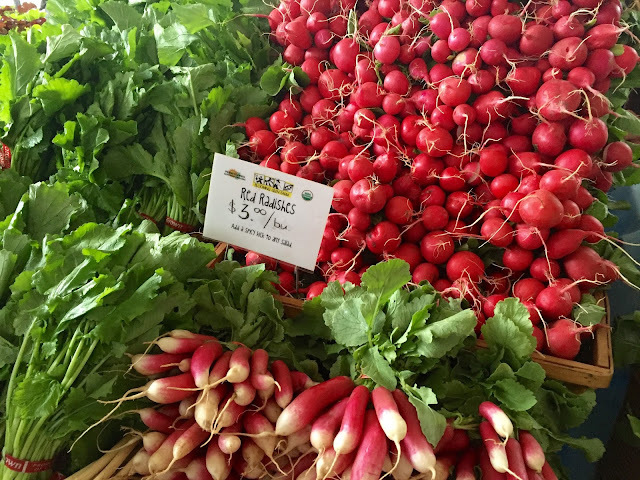 Blooming Glen was back with two kinds of ravishing radishes (traditional red globe and French breakfast), along with arugala, leaf spinach, green garlic and a few other items. Queen Farm had its usual assortment of oyster mushrooms and at least six varieties of greens. Weaver's Way, the northwest Philadelphia food coop which operates two small-scale farms, was big on greens, too. Like Queen Farm they also offered colorful lilac flowers. Savoie Organic Farm had some cabbage, but otherwise only offered seedlings of tomato and vegetable plants for sale, as did Happy Cat Farm. Sue Miller of Birch Run Hills Farm with her cheeses (and veal and pork products) returned, as did Hillacres Pride, offering cheese and other dairy products as well as meats. And Shellbark Hollow returned with its capric dairy offerings. Other vendors at the season's first market: Bennett Compost, Good Spoon (soups), Griggstown Farm (poultry, pies), Green Aisle Grocery (jarred foods), John + Kira Chocolates, LaDivisa (charuterie), Longview Floweres, Market Day Canele (sweet and savory baked goods), Paradox Vineyard (wine), Philly Fair Trade Coffee Roasters, Shore Catch (fish), and Spring Hill Farm (maple syrup). I thought asparagus was at least a few more weeks away, but it appeared at two stalls at the Reading Terminal Market today, along with two other sure signs of spring: morels and ramps. Over at Iovine Brothers Produce, pencil-thin asparagus from Mexico stood side-by-side with heftier (but by no means excessively large or woody) stalks from Sun Valley Orchards in Swedesboro, N.J. Tough choice: 2,300 miles from Mexico or 30 miles from Swedesboro? The Fair Food Farmstand also had asparagus today from a producer on the other side of the Delaware. Expect to see lots more asparagus in the next few weeks. I hope they hold out for the opening of Headhouse Square and other farmers' markets in early May. Iovine's morels no doubt came from a greater distance that the Swedesboro asparagus. I didn't ask, but my guess is the Pacific Northwest. Still, the plastic and tray wrapped fungi hadn't dried out, and there was only one soft spot showing signs of deterioration. Hardly locally foraged like I used to get from the late Sam Consylman or found at the Dane County Farms Market in Wisconsin, but they'll work. I passed by the ramps at Iovine's (too expensive) but quickly grabbed a $4.95 bag of them at Fair Food: excellent quality and at about half the price. I didn't get a chance to visit the Rittenhouse Square Farmers' Market today, but its weekly newsletter said to expect local fiddleheads and watercress in addition to ramps. I'll be using the asparagus, morels and ramps to replicate a dish first enjoyed nearly 20 years ago at L'Etoile, the shining star of the restaurant renaissance in Madison, Wisconsin. There, asparagus, mushrooms and shallots were scattered about a plate centered by a ring of savory custard and adorned with a light butter sauce. I'll go the same route tonight, wih both morels and oyster mushrooms in the mix and ramps replacing the shallots. A crusty baguette and a glass or two of chilled Alsatian Riesling will complete the meal. Mike Holahan's death last week, at age 57, leaves a void for his family – his partner in life and business Julie, daughter Isabella and sons William and James – as well as shoppers and fellow merchants at the Reading Terminal Market, and the Philadelphia food community. I won't repeat the facts of Michael's life, including how he started the Pennsylvania General Store and his leadership of the Reading Terminal Market Merchant Association. You can read them in his Philadelphia Inquirer obituary and at the funeral home's website. Instead, I'll simply recount two parts of his life (with some video help): one I only learned about after his death, the other one I lived with him. Another Michael is the one I first met more than 25 years ago, a man passionate about food and the people who bring it to our tables. This was when he started the Saturday Morning Breakfast Club, a gathering of foodies on that day which attracted anywhere from a half-dozen to three dozen participants. Our topics were wide ranging, and frequently featured guest speakers, both merchants and outside experts. One of the more memorable sessions was for Valentine's Day. Mike had arranged for the pastry chef from Deux Cheminées to discuss how to make chocolate truffles. Unfortunately the pastry chef had emergency dental surgery, so the restaurant's proprietor, Fritz Blank took his place, bringing along a friend who was attending the Philadelphia national convention of the Association of American Scientists, who Fritz knew through his former career as a microbiologist. The friend was Harold McGee, the author of On Food and Cooking. McGee brought along samples of cocoa beans both fresh and in various stages of processing and explained the science of making chocolate. So as not to disappoint the many ladies who attending in hopes of making truffles, Fritz gave them the recipe. The Saturday Morning Breakfast Club also served as an introduction to the people of the market, including its managers (Marci Rogovin when the club started, then Paul Steinke when he came on board), and merchants. Ann Karlen stopped by to talk about the Fair Food Farmstand before it opened. Luminaries from the Philadelphia food community also visited to share their stories and expertise, including Jack Asher of Asher's Chocolates (Mike sold a food invention of his, Keystone Crunch, to Asher). Indeed, the regional history of chocolate manufacture was one of Mike's passions: you can read an earlier entry on this blog about a talk he gave on the subject here. 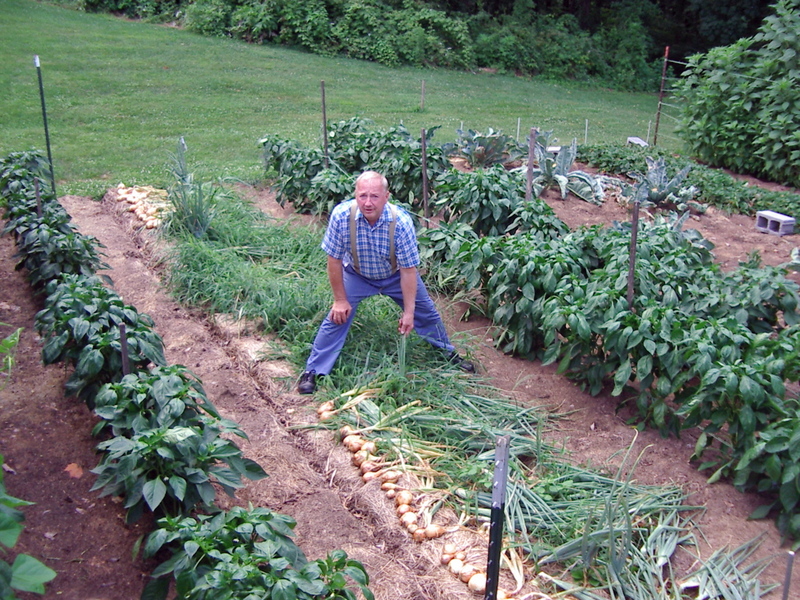 Sam Consyman after pulling onions in his Lancaster garden. Photo by Robert Libkind. Sam Consylman, a retired auto radiator repairman whose passion was foraging, organic gardening of both common and unusual produce and teaching younger generations about growing and gathering food, died Feb. 26. 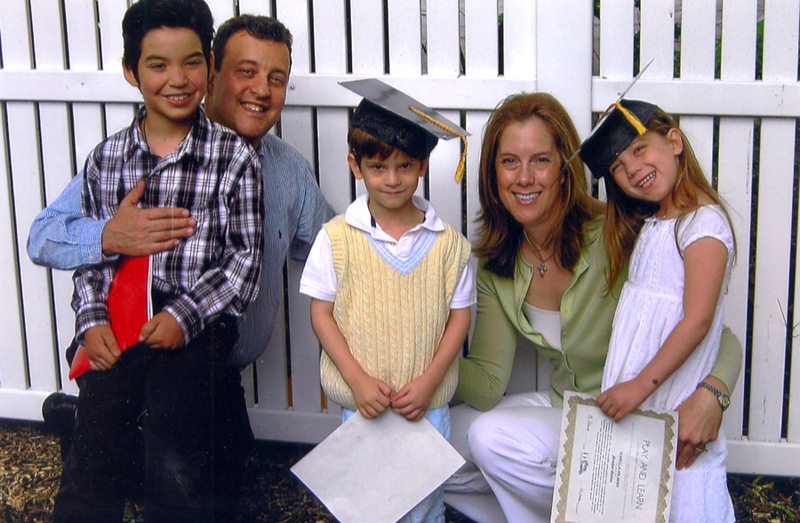 Sam, who won a round against colon cancer nearly 20 years ago, was 74. I met Sam when Earl Livengood operated his produce stall at center court in the Reading Terminal Market. Sam was a friend of Earl and helped out at various farmers' markets. But Sam also supplied Earl with choice morsels he found in forests and lowlands: wild berries, greens and, most delectable of all, morels. At his Lancaster home Sam had a small scale gentleman's farm, with everything from root vegetables to fruit trees. Sam Consylman at Fairmount Farmers Market. Among the many things Sam taught me was the living definition of "dead ripe". During a visit to his patch of green Sam led me to his small orchard and found a peach lying on the ground which, he told me, wasn't there a few hours go. Some ants had already found it, but Sam brushed them off, surgically removed the spot they had been working on, and handed it to me. It was incredibly juicy with a subtle but absolutely peachy flavor: the perfect peach. And dead ripe, having just fallen, naturally, off the tree. He was gathered a native American food well-known in Appalachia: poke. Each fall Sam would dig up pokeweed from his favorite Lancaster County foraging ground and store them buried in sand on two six-foot shelves in his basement, stacking them tightly to preserve moisure, and watering them daily to "mimic the same way they'd get moisure in the wild". By January they start to send out edible roots, which you can use like you would asparagus. 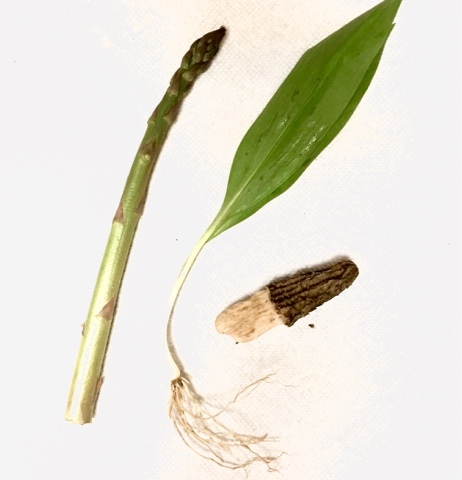 The leaves, berries, taproot and older shoots are poisonous. Although the garden took up much of his retirement time, Sam was hardly averse to meat. In addition to being an avid freshwater fisherman he regularly took to the field with his gun. He had agreements with some central Pennsylvania farmers to patrol their lands of pesky varmints, and the result was a regular supply of ground hog for his wife, Mary, to fry-up. He brought the chicken-fried rodent to Philadelphia to share with some of his farmers market customers. Quite tasty. He shared his passions with young people. In addition to being a supporter of the Manor FFA (formerly known as the Future Farmers of America) in Millersville, Sam was also dedicated to at-risk youth, leading a series of Smart Angling fishing workshops for the Lancaster County Youth Intervention Center under the auspices of the Pennsylvania Fish and Boat Commission. A memorial gathering will be held at the New Danville Fire Company, 43 Marticville Road, Lancaster, on Friday, March 11 from 2 to 8 p.m. Contributions in his memory may be made to the Manor FFA, c/o Penn Manor High School, 100 E. Cottage Ave., Millersville PA 17551. 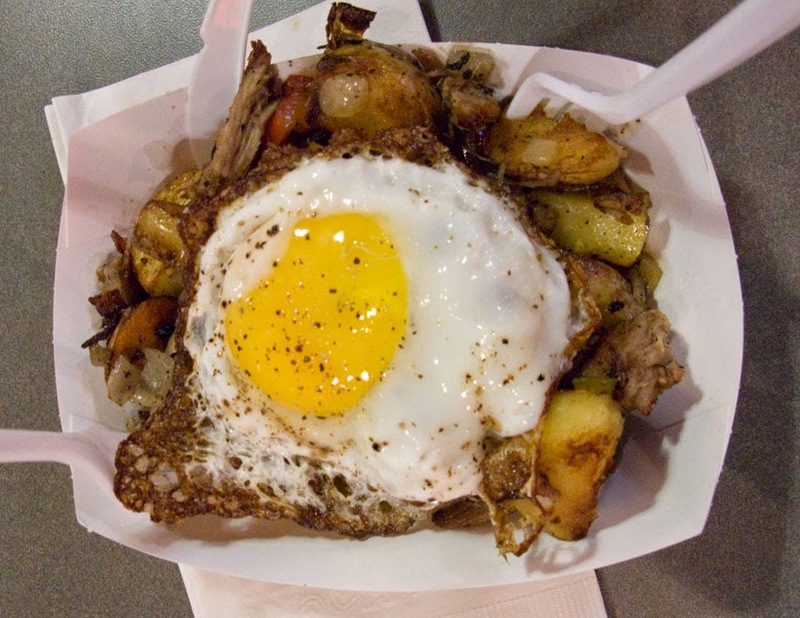 No more lamb tacos for lunch or lamb hash for breakfast at the Reading Terminal Market. Border Springs Farm has eliminated sandwiches and platters to eat within the market from its offerings. That makes it, in the nomenclature of the market's lease structure, a "purveyor" rather than a "blended purveyor/food court" merchant. Owner Craig Rogers may be able to convert the change into a little break on his rent when his lease comes up for renewal, since the market gives a discount to "purveyors" when compared to its "food basket", "mercantile" or "food court" businesses, each with its own rent structure. A few customers complained when they couldn't get their fix of lamb taco, according to Nick Macri, the former Southwark chef who manages the RTM operation. On Twitter, @foobooz remarked: "...it was a good spot for an excellent sandwich without the wait." Sure, but maybe that's why they don't offer sandwiches anymore. Not enough people bought them. Since the overwhelming majority of customers come for the butcher operation, Macri isn't concerned. And he's happy to offer a broader line of prepared foods to take home as well as fresh lamb. What the change does accomplish is open up space for more room to create prepared foods, like the new lines of meatballs, vacuum packs of formed and sliced gyro meat, and lamb liver terrine in Border Spring's refrigerated display cases. Selling uncooked meat has always been the biggest part of Border Springs' business since it opened at the market in May 2013. 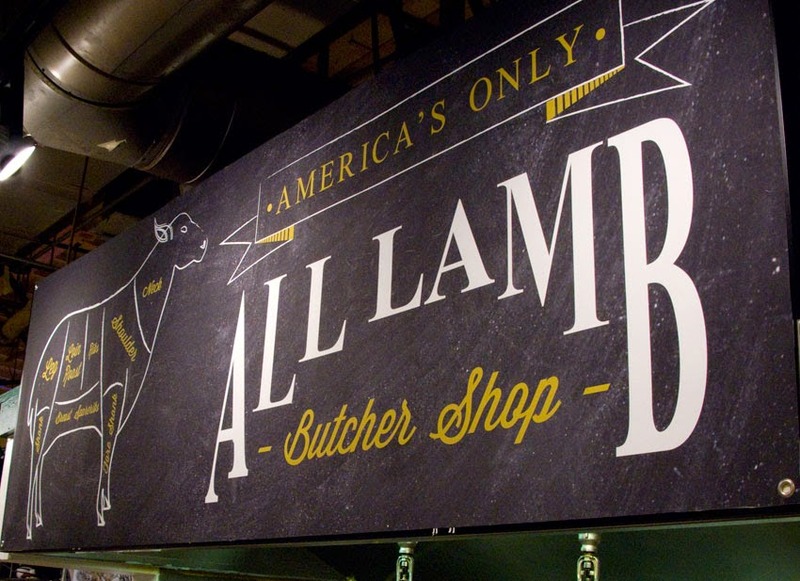 Rogers, whose lamb farm is located in southwestern Virginia near the Blue Ridge Mountains, had already established a wholesale business in Philadelphia, hauling his lamb north to local restaurants, including Zahav. By opening the stall at the market Rogers not only created a base of operations for his wholesale business, but an outlet for lesser cuts —like necks and breasts — that he couldn't otherwise sell. Of the 30 "Great Places in America" for 2014 selected by the American Planners Association (APA), only one has a roof over it: Philadelphia's Reading Terminal Market. Except for the RTM, all the other "places" are public parks, streets, neighborhoods, scenic vistas and other outdoor entities. Even the incoming president of the planner's group was unaware of the RTM's uniqueness as the only interior space among this year's "great places". At this morning's celebratory news conference at the market's center court, Carol Rhea, president-elect of the APA, had to check with a staff aide when I asked her to confirm the RTM was the only interior space on this year's list. Rhea praised the "authenticity" of the market. "You won't see a Spataro's at the airport," she told me after the event. Deputy Mayor for Economic Development Alan Greenberger and Brent Cossrow, vice chair of the Reading Terminal Market Corporation also spoke at the ceremony led by Paul Steinke, market general manager. The APA designated 10 public spaces, 10 streets and 10 neighborhoods for its 2014 awards. Sharing the public space honors with the Reading Terminal are: Bayliss Park In Council Bluffs, Iowa; Cliff Walk In Newport, Rhode Island; Delaware Park In Buffalo, New York; Great Plains Trails Network In Lincoln, Nebraska; Lake Mirror Park In Lakeland, Florida; Lithia Park In Ashland, Oregon; Point State Park In Pittsburgh, Pennsylvania; Rainier Vista In Seattle, Washington; and The Lawn At The University Of Virginia In Charlottesville, Virginia. No matter where he travels, Bob investigates local public markets and food purveyors. When he's home in Philadelphia, that primarily means the Reading Terminal Market, but also the Italian Market and various city farmer markets, in season. Needless to say, he's a Big Hungry Boy who enjoys cooking almost as much as eating.